The small English city of Bristol, between Somerset and Gloucestershire, has reinvented itself again and again. Its harbor, dating from the 13th century, was an important port of trade and center of shipbuilding and airplane manufacture until destroyed in WWII. From the 17th century until abolition, it was a key port in the Triangular Trade that linked England, Africa and America in the buying and selling of slaves, manufactured goods, sugar and rum. Today this gateway to England's West Country has the UK's fastest growing economy outside of London. It's a trendy, liberal university city with an arty vibe; a lively music, art and theater scene; a colorful waterfront on the River Avon; some excellent, fun museums, a growing reputation as a foodie center and one of the top European capitals of street art and graffitti. In August, its annual International Balloon Fiesta sees some of the biggest mass launches of hot air balloons in Europe. And the shopping is pretty great too. Bristol is just a little over 100 miles from London and less than two hours by train. Train travel is recommended as parking is difficult, and Bristol's public transportation is easy to use. The easiest way to get around Bristol is by the excellent local buses operated by First Group UK Bristol, Bath and West. Tickets for getting around inner Bristol start at about £1 for a one-way, 3-stop trip in the Inner Bristol Zone. (As a visitor, you are unlikely to need any other zones.) There is no financial benefit to buying tickets online or using mTickets on your mobile phone and, unlike London where drivers do not take cash, you can still pay for your Bristol bus tickets with cash. 9 a.m. : Bristol Temple Meads Station is the most central rail station in Bristol and most people arrive there from other parts of the UK. Before you leave the station, head around the back to Harts Bakery under the arches for a coffee and croissant or a hunk of their popular sourdough bread. On your way around, have a good look at the station — it's a historic landmark in its own right. It was designed and built in 1840 by Britain's famous pioneering architect and designer Isambard Kingdom Brunel. 10 a.m.: Catch a bus to your hotel from the front of the station. We recommend the Ibis Bristol Centre for minimalist style and central location on a modest budget. For a bit more of a splurge, try the Hotel du Vin Bristol. It was a sugar warehouse and a tobacco warehouse before the Hotel du Vin group turned this Grade II Listed building into luxury boutique hotel. It's loaded with oak beams and period features but also has huge, fabulous beds and truly amazing bathrooms. Drop off your bags and head for College Green in time for a great walking tour. 11 a.m.: Take a Bristol Street Art Tour with WhereTheWall to see why this is one of the world's great capitals of street art and graffitti. Bristol is Banksy's home town after all. And most years, UPFEST (Urban Paint Festival: Europe's largest street art festival) adds new work to different parts of the city — some of which remains for a whole year. How Bristol's rise to street art paradise happened is a story in itself. After the Blitz destroyed about 85,000 buildings during WWII, Bristol rebuilt in the 1950s and 1960s with quick, cheap concrete. Suddenly, whole neighborhoods presented blank walls just crying out for decoration, and graffiti artists rose to the challenge. Instead of fighting them, the city fathers joined in, inviting artists to express themselves in parts of Bristol that were destined for eventual redevelopment anyway. Now you can find most of the top street artists in the world having a go. The tours from College Green run for two hours weekdays and weekends all year round. They are very popular, so it's important to book in advance. Bristol is also the home of Aardman Animations, the creators of Wallace & Gromit. Over the years, they've raised more than £6 million for Bristol Children's Hospital with art trails featuring their familiar characters. Gromit Unleashed, with 80 giant Gromits decorated by famous artists scattered around the city, was wildly successful in 2013. The group is planning to launch a new art trail in the summer of 2018. 1:30 p.m.: Browse the tiny food stalls and cafés in the Glass Arcade at St. Nicholas Market, before plunging in to the depths of the market itself. There are all sorts of traditionally British and not-so-traditional bites on offer — sausages, raised pies at Pieminster, koftas, Moroccan food, cakes and cookies. Try a falafel at Eat a Pitta, or just watch the hyperactive crew stuff the sandwiches at the speed of light. The Nails Market features local independent traders selling gifts, original artwork, handmade jewelry and vintage clothing, Friday and Saturday 9 a.m. to 5 p.m.
Bristol Farmers Market is a weekly opportunity to buy local produce direct from the producers. It's an outdoor market, held Wednesdays from 9:30 a.m. to 2:30 p.m. on Corn Street and Wine Street. The Friday Food Market, from 10 a.m. to 4 p.m., outdoors on Wine Street features street food and goodies made by local producers. 4:30 p.m.: After all that hectic commerce, you could probably use a quiet break. From the market, cross Bristol Bridge and continue straight ahead on Victoria Street for just under half a mile, then turn left on Church Lane where you will find Temple Church and Temple Gardens. The Temple Church is the remains of a 14th century church — today visitors can view its walls and its leaning tower (the tower leans 5 feet on the vertical even though its medieval builders tried to correct it halfway up). When the already derelict church was bombed during Bristol's WWII blitz, it enabled archaeologists to excavate and find the remains of the original round church of the Knights Templar. You can't go inside, but you can see the footprint of the original church through the wrought iron gates on either side of the nave. The site is surrounded by lovely gardens and is free to visit at "any reasonable hour". Next, retrace your steps back across Bristol Bridge and turn left on Baldwin Street. Then its a short left onto Clare Street, a short left onto Broad Quay and a left onto Anchor Road. Continue on Anchor Road, beside the short city center channel known as Harbourside, to The Stable. 6:30 p.m. : Sample cider at The Stable. If you think cider comes in only two varieties — hard and soft — or if you thought that the beery, dry, mass produced cider you can find in most English pubs is what British cider is all about, the West Country has a few lessons for you. Somerset, the county most associated with cider and apples, is right beside Bristol, and the local artisan-produced ciders and perries (similar to cider but made from pears) will open your eyes — and your palate. The Stable, housed in a stripped bare warehouse, is the Bristol branch of a small West Country group. They offer 50 different ciders and perries, tasting boards of small portions of five different ciders, and guidance for newbies from cider master experts. It's a bit noisy inside, but the outside tables are perfect for people watching. Later, if you're hungry, they serve pizza and a variety of casual dishes to soak up all the cider. They also have a vegan menu. 9 a.m.: If you're an early riser, start your day by exploring the Old City Heritage Trail. There's not much of the trail left, but if you like finding hidden secrets in the middle of a modern city, it's worth spending a little time within Bristol's old city walls. The walls themselves are gone, but their shadow shapes the streets that once ran around them — St Nicholas Street, Leonard Lane, Bell Lane and John Street and Tower Street. On Bell Lane, St. John the Baptist Church, sometimes called St. John on the Wall, is the last of five churches that were built into Bristol's city walls. Its tower and steeple stand over St John's Gate, once the main entrance through the city walls. There are several narrow passages, including St. John's Steep, which was the location of another gate into the city. Near the end of this pedestrian passage, a small wall surrounds a stand of trees. It's St. John's Burial Ground, where plague victims where buried in 1665. 10 a.m.: Head for the Waterfront to catch a ferry up the floating harbor. The ferries start running from here at 10:20, so first stop for a coffee at Just Ground Coffee. It's a kiosk on St. Augustine's Parade, just above the Waterfront, where they make some of the best coffee in this very coffee conscious city. Your nose will let you know if you've found the Waterfront — an odd name for the canal-like-spit of the floating harbor. The Floating Harbor, by the way, is a channel between two locks on the tidal River Avon, created in the 18th century to keep the water level in the harbor stable. 10:20 a.m.: Board a Bristol Ferry Boat toward Hotwells, and get off at the SS Great Britain. It's a ten minute trip and costs £1.70 each way or £2.90 round trip. The ferries leave every few minutes throughout the day. 10:30 a.m. : Visit the SS Great Britain. Isambard Kingdom Brunel's gigantic ocean going ship was a wonder of its day — the world's first iron-hulled, screw-propelled steam passenger ship under sail. For a time, in the mid-19th-century, she was the longest and heaviest passenger ship in the world; at 322 feet, she was 30 feet longer and 1,000 tonnes heavier than any ship afloat. Built for the Bristol to New York passenger route, and equipped with secondary sail power from six giant masts, she broke records, crossing the Atlantic in an at-the-time unheard of 14 days. Leave at least two hours for a fascinating visit that includes stories of romance; adventures and misadventures on board; and a guided tour of well furnished passenger, crew and officers quarters, cargo holds and engine rooms. And unlike the cramped below decks of other historic ships you may have visited, the interiors of the SS Great Britain are big enough for most visitors to stand up straight. 12:30 p.m.; Take a break. Have a bite to eat and something non-alcoholic to drink because you will need energy and your wits about you for the next part of your day. There's a handy, inexpensive Dockyard Café beside the ship for a light meal. Hang on to your ticket because you'll be going back aboard. 2 p.m.: Are you brave enough to step into the shoes of a Victorian sailor and climb the main mast of the SS Great Britain? Exercise your inner daredevil — climb the rigging of the main mast, to a height of 25 meters (about 82 feet) above the ground. Then, if you're really brave, you can walk out on the yard arm. Don't worry — you'll be harnessed and hard-hatted. The Georgian House Museum: An upstairs/downstairs look at life in a sugar plantation slave owner's home, circa 1790. There are 11 rooms on four floors, from the kitchens in the basement to the elegant entertaining rooms upstairs. Visiting is a bit like walking around in someone's private home. Admission is free. @Bristol: Bristol's interactive science center is more of an experience than a museum. There are hundreds of different things to see, do, touch and play with, and it's as much fun for grownups as it is for children. There's also a planetarium attached and after hours experiences for adults. Admission is £15.30 for adults. 4 p.m.: Head back to your hotel to decompress before going out for the evening. 6 p.m.: Have dinner early so you can make the curtain (usually 7:30 p.m. or 8 p.m.) for one of Bristol's great theaters tonight. The Bristol Old Vic celebrated its 250th anniversary in 2016 as the oldest, continually operating theater in Britain. They marked the celebration with a major, multi-million dollar renovation project. Behind the historic facade lies a comfortable, state of the art 21st century theater. Since it's publicly funded by the Arts Council England and the Bristol City Council, the theater is able to be arts-led, rather than commercially-led, in its choices and productions. That doesn't mean it's all dead serious. In a typical year there will be classics, touring productions, comedy, children's theater, music and Shakespeare. Shows are performed in repertory — in other words, they alternate productions rather than having long runs of one play at a time. This is one of England's real treasures so, book tickets well before you arrive. The Bristol Hippodrome is the city's main commercial theater. This where you'd go to see touring productions of the main hits from London's West End, as well as shows in their pre-London try-outs. It's also a venue for comedians and cabaret acts on tour, opera, ballet, musicals and dance. And if you're visiting during the holiday season, this is where you can see a Christmas Panto. If you are going to the theater you'll want something quick, relaxed and not too far from the theater. These are within a 10 minute walk or less of both theaters. Raj: A middle-of-the-road, old fashioned Indian restaurant, in white washed rooms below ground level. Popular with artists rehearsing at the theater and their guests. Just a few doors up the road from the Bristol Old Vic on King Street. Graze Bristol: A big, airy pub that aims to emulate the old fashioned chop houses of London and New York. The menu is very meaty but there are a few vegetarian choices and plenty of interesting sides for veggies to choose as well. On Queen's Square, about two minutes from the Old Vic, ten minutes from the Hippodrome. Bordeaux Quay Brasserie: A sophisticated yet casual brasserie near Pero's Bridge on the waterfront. The focus is on British and European influenced sustainable foods. It's about a ten minute walk from either theater. 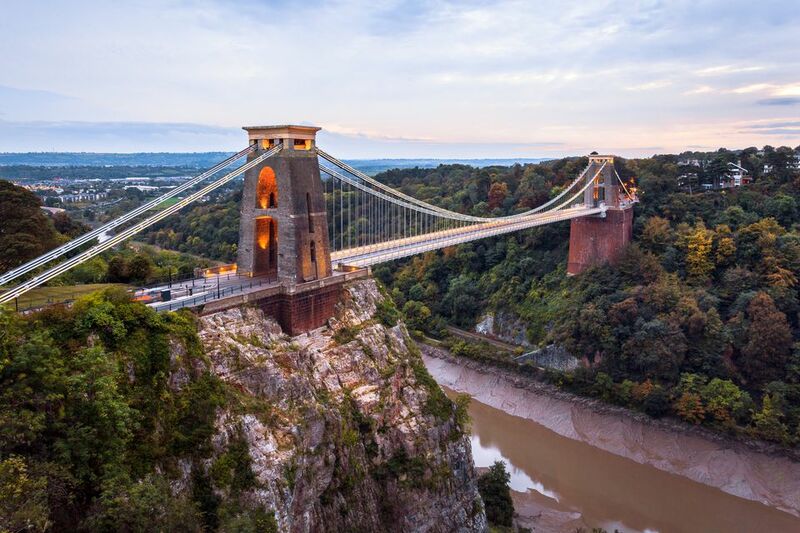 No visit would be complete without a visit to Clifton for close-up view of Bristol's world famous symbol, the Clifton Suspension Bridge and a stroll around the lovely Georgian neighborhood of Clifton Village. 8:30 a.m.: Catch the No. 8 bus from College Green in the city center for the ten-minute ride to Clifton Village. Stop off at the Mall Deli Café for a coffee from a local roaster. They only serve breakfast on weekends, but during the rest of the week, their fantasy cupcakes, brownies and cakes are hard to resist. Before you leave, pick up a picnic of cheeses and savory little pies to enjoy later under the trees on Clifton Down. 9:15 a.m.: It's a half-mile walk, about 15 minutes at a leisurely pace, to the Clifton Suspension Bridge. Walk north to the end of the road known as The Mall and turn left on Gloucester Row (not to be confused with Gloucester Street, which you will see first). Then just stay on this road to the bridge. There are several different ways to see and enjoy this landmark and it's worth doing all of them. Cross the Bridge: The views of the winding River Avon, 245 feet below, and the dramatic Avon Gorge are spectacular. At the far side (the bridge is only about 700 feet long), there's a very good visitor center. There you can learn about the history and engineering innovations of the bridge, conceived by and credited to Isambard Kingdom Brunel, but completed by others after his death. You can also find out about Sarah Ann Henley, the woman who, in 1885, jumped from the bridge and survived — supported by the "parachute" of her Victorian skirts. Climb to the Observatory on Clifton Down: Walk back toward Clifton Village, the way you came. Turn left on Observatory Road and, about 200 yards along, look for a path on the left into Clifton Down. It's a easily manageable uphill climb to the Observatory. From there you can enjoy a dramatic view of the bridge as well as the colorful Georgian terraces that climb Sion Hill, opposite. Originally a snuff mill, a 19th century owner converted the building to an observation tower and installed a camera obscura with an image projected on a white washed wall. If you are not claustrophobic, descend the tunnel (120 steep steps inside the cliff face) to the Giant's cave, a viewing platform about 250 from the ground and another great view. Tickets for the camera obscura cost £2.50 and for the Giant's cave £2.50 or a combined ticket for £4. The Observatory opens at 10 a.m. but the views of the gorge from the top of the Down are free whenever you get there. Climb Sion Hill: Return the way you came and about 100 feet past the start of the bridge, take the footpath on your right, straight across the park then turn right on Sion Hill. About 150 feet along, you will come to a viewing area with an orientation table on your right. Stop here to take your best pictures of the Clifton Suspension Bridge. On your way back to Clifton Village, where you'll find some great cafés, shopping and the bus stop, enjoy this district's superb Georgian houses. There's a fork in the road about 20 feet past the viewing area. Take the left branch and the next left turn is Caledonia Place, a pristine terrace of listed Georgian homes with a garden running down the center. Take this street downhill to the commercial area of the village and retrace your steps to Clifton Down Road to catch the No. 8 bus back to the center of Bristol or all the way to Temple Meads Station.